Photo Credit: rocky-peak Holidays Ltd. Bow Valley residents will have the opportunity to learn about the fate and future of grizzly bears in Alberta from one of Canada’s top grizzly bear researchers. Gordon Stenhouse, program lead of the Foothills Model Forest Grizzly Bear Research Program, will present Grizzly Bear Research and Science in Alberta at the Canmore Collegiate High School Theatre, Thursday (Feb. 26) at 7 p.m. Bow Valley WildSmart education program director Kim Titchener said Stenhouse plans to discuss the results of the decade-long research grizzly bear research program and how those results apply to grizzly bear conservation throughout Alberta. “This one is so pertinent, it’s one of the main reasons why people even visit the valley and that’s one of the unique reasons about living here. It’s one of the few communities that coexist with wildlife and grizzly bears,” Titchener said Tuesday. 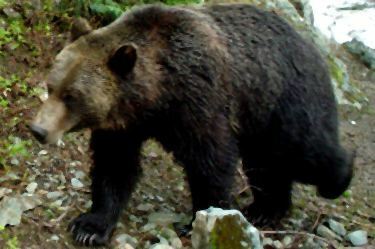 The Foothills Model Forest Grizzly Bear Research Program was initiated in 1999. It grew to become one of the largest and most comprehensive bear research programs in North America. Stenhouse, who has researched polar bears, caribou, musk oxen, moose, Dall sheep, peregrine falcons, wolves and Arctic-nesting geese, has been with the Foothills Research Institute since 1998. He is on secondment from Sustainable Resource Development Fish and Wildlife and is an adjunct professor at the Western College of Veterinary Medicine at the University of Saskatchewan. Stenhouse is also the past chairman of the Alberta Grizzly Bear Recovery Team. The current population estimate of grizzlies in Alberta, based on Stenhouse’s DNA work, suggests the province is home to less than 500 grizzly bears, which were listed as a threatened species in 2002. At that time, the population was believed to include 1,000 individuals. “The committee on endangered wildlife is saying the grizzly bear is a threatened species and that is a hard thing to swallow as an Albertan, to think that we might not have grizzlies living here in the future,” Titchener said. The Province last year extended a moratorium on the grizzly bear hunt to this year, pending the results of a population survey. Before the moratorium, hunters killed an average of 14 bears a year. Grizzly bear conservation is a political issue, Titchener said, with hunters disputing Stenhouse’s DNA population estimate. “Everyone doesn’t necessarily agree with the management tactics or what the future management of bears are, but we all agree that we want bears on the landscape.” She said it is a starting point to finding a way for all of the different voices to work together to keep grizzly bears from disappearing from Alberta. Stenhouse will also be able to answers questions on what the Province is planning to do next to further grizzly bear conservation.